Podio is the most dynamic, flexible, powerful and collaborative business system on the planet. People ask us all the time, what exactly is Podio? Is it a CRM? Is it a Project Management Tool? Is it a Marketing Automation platform? Our answer is: Yes, Yes and Yes – and a whole lot more. Podio is actually an incredibly powerful set of building tools that we use to create 100% bespoke business systems that can work within any area of your business. Through the power of Podio, we can connect every part of your business together, ensuring you have complete end-to-end visibility, productivity and automation. Podio is also the single best collaboration tool on the market, and brings together your business processes, data and people to create a comprehensive and efficient ecosystem. And even better, it’s backed by the power of Citrix solutions, whose products are used by more than 400,000 organizations and over 100 million users globally. Podio is part of the Citrix SaaS productivity tools alongside ShareFile and RightSignature. This powerful family of products combines to deliver an unrivalled business productivity set. You read that correctly, don’t bother rubbing your eyes. With one of our Platinum licenses (available through Gamechangers and included as standard in most of our Sector Solutions) you get an unlimited amount of online data storage using the market leading Citrix ShareFile system. No more storage quotas. Access all of your data (no matter how large) anywhere in the world on any device. 100% secured. ShareFile is a simply stunning SaaS data storage system (think DropBox but on steroids) that can even connect to your existing file systems to ensure that your existing data locations are able to be shared securely using the ShareFile platform. It’s fully integrated in Podio and helps to turn Podio into the ideal document management system. Business is all about relationships, and a good system will promote an active relationship management process to ensure your team is always at the front of your clients’ (or prospects’) minds. We can customise all aspects of your relationship system – from simple reminders to complex marketing touch points that occur based on external activities – and ensure that all data is tracked in your system and reportable. You don’t have to wonder how your relationships are managed any longer…you can see it in black and white. With one of our Platinum licenses (available through Gamechangers and included as standard in most of our Sector Solutions) you get access to the Citrix RightSignature system. If your business relies on getting signatures from clients, then RightSignature can be your saviour. No more wondering where the paperwork is, no more risking going ahead without signatures in place… We can set RightSignature up to automatically send and request signatures on your key documents and have these documents signed online by your contacts in a fully legal and binding system. It’s always nice to be able to stop a small problem before it turns into a large one. For manufacturing companies, this can be critical – a minor error in your production line can result in thousands of dollars lost in material and time. We can develop any level of escalation you need across any aspect of your system. You want to make sure your sales pipeline is worked on every week? We’ll warn you if it isn’t. Need to automatically shut off a machine if your thresholds are breached? We can develop a customised shut-off switch that reacts instantly. There are endless possibilities. Podio is all about data. Once we have information we can spin it out in a huge variety of ways in order to make sure that everyone in your organisation is getting the information they need. We can build customised automated reports that gather information from across the system and sends them to anyone you wish (our own clients get an automated weekly progress report we know they love), or we can integrate a real-time dashboard solution that will allow you to display real-time data on a screen or monitor in your office – a great way to engage the whole team in key metrics. The Internet of Things is the latest buzzword you may have heard, but what it really boils down to is the ability to connect offline “things” into the digital world. We have advanced IoT integration built right into our Gamechangers Podio setup, and we can integrate pretty much anything you want (providing it has some way of getting information in and out of it!). You want the lights to flash when there is a critical error in your machine line? Done. The impossible is now a couple of clicks away. Podio is an automation workhorse for your business. We can automate almost any element of your business processes to develop maximum flexibility. Think of how much time your team spends on mundane activities that could be automated if you had the power – document creation, process management…you name it. Podio’s automation is 100% flexible and can be completely customised to your business processes. By developing smart automation into your Podio system we can seriously enhance your productivity. Collaboration is the key to the modern workplace, particularly in a world where more and more people are working remotely. Podio is an immersive and collaborative space where you and your team can collaborate to maximum efficiency. Podio is also an incredibly powerful way of collaborating with your suppliers, partners and clients. We can build secure and private spaces to ensure that they only can see what you want them to see, and you’ll find working in Podio with your external teams to be an incredibly engaging process. HOW DOES PODIO STACK UP AGAINST THE REST? Take a look at how Podio stacks up against three leading SaaS systems. Before Podio, some of our clients had to use all three (and more) to connect all areas of their business together. Podio does the work of all three systems in one integrated collaborative environment. Maximum efficiency, maximum power, one cost-effective system: Podio. 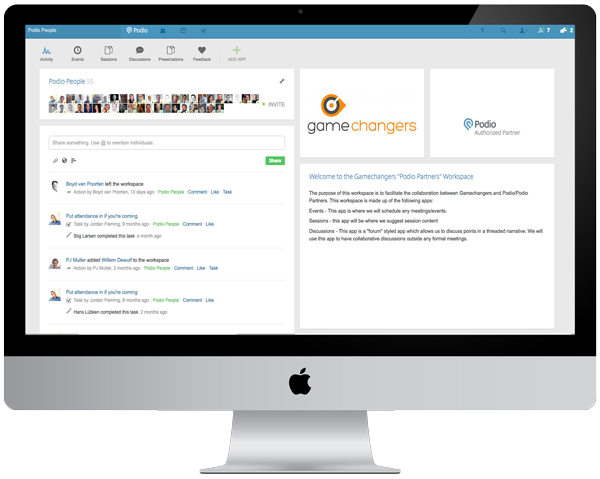 *Podio costs based on purchasing a minimum of 5 Gamechangers Platinum Podio Licenses that includes Podio, Unlimited ShareFile Storage and RightSignature integration. *Zendesk costs based on Enterprise plan with addition of Chat & Talk modules.